Aggregate, lumber, paper products, frozen fish, potatoes, salmon, fish feed, fertilizer and others. The port labour is provided by a local union � the St. Croix Stevedores and Affiliates, contractually tied with local stevedoring firms. Security at the port is provided by Port employees. 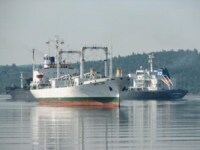 Security is on site at all times when an ocean vessel is in port and all traffic is monitored. The Seafarers Mission (CCCSMI) is located in the Industrial Park providing phone, internet, and relaxation to the visitors from all calling vessels. Berth scheduling is controlled through the port administration and managed under an acknowledged access agreement. 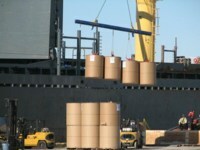 All vessels must be scheduled in according to cargo, vessel specs, time requirements and other factors. To view the updated schedule, please click here. Pilotage is required by the Bayside Port Corporation for all ocean vessels berthing and leaving the facility. Two private pilots are available locally. The port is located in the Champlain Industrial Park on Route 127, which intersects Route 1 approximately 10 kilometres from the access road. Route 1 provides direct access to the United States, Saint John, and Moncton. 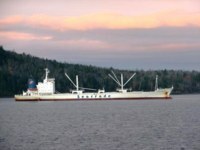 The Marine Navigation Service Fee for foreign flag vessels in the Bay of Fundy is 8.9 cents per tonne of cargo loaded or unloaded, the lowest MNSF in Atlantic Canada.